Moroni is a coastal town that serves as the capital of Comoros, an archipelago in the Indian Ocean. In 2003 the city had a population of 41,577 people making it the largest city in the archipelago. It is simultaneously one of the least populous capitals on or near the African continent. Moroni is also the capital of Grande Comore (also known as Ngazidja), the largest of three islands that make up the republic. The city covers an area of 30 square kilometers (about 12 square miles) and is located at the base of Mount Karthala, one of the largest active volcanoes in the world. Moroni experiences a maritime tropical climate that is defined by warm temperatures and heavy rainfall throughout the year. The city of Moroni was founded in the 10th century as a capital of a sultanate connected commercially to the Swahili City States along the east coast of Africa in what now constitutes the nations of Somalia, Kenya, Tanzania, and Mozambique. All of these cities were settled by Arab immigrants who intermarried with the local inhabitants. Monori’s language and culture are similar to the Swahili coastal cities. In 1958 Moroni succeeded the city of Dzaoudzi, located on the island of Mayonette, as the administrative capital of the country. 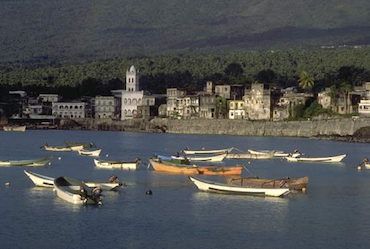 Comoros became an independent nation on July 6, 1975 and Moroni became the capital. The nation lived mostly in peace until violence erupted in April of 1999 due to the refusal by the Comoros Island government to accept a proposal by representatives of the Anjouan Islands in the Moroni archipelago who demanded greater autonomy for their three islands. In December 2003 the president signed the Moroni Agreement on Transition Agreements. In 2010 as a part of a humanitarian project, the U.S. Navy Seabees constructed the Hamramba School at Moroni. Cocoa, coffee, and vanilla are principal exports from the Port of Moroni. The port’s facilities include warehouse storage for imports, exports, and for petroleum products. The city produces metals, soft drinks, processed and distilled essential oils, cement, and wood products. Places of interest and landmarks in Moroni include the Town Center which contains buildings dating back to the first Arab settlements and the handiworks and souvenirs of Volo Volo Market. The Karthala volcano, although active, remains a place for hiking and the Coelacanth Marine Park is located on the southern coast of the island. The Comoros is an Islamic nation. Not surprisingly most of the public festivals celebrated in Moroni follow the Islamic calendar. The city’s architecture is influence by the long dominant Arabic culture and it has numerous mosques including Chiounda, a pilgrimage center. Independence Day is celebrated on July 6th and displays the land’s rich culture through feasts and traditional music and dance. Roman A. Cybriwsky, "Moroni," Capital Cities around the World: An Encyclopedia of Geography, History, and Culture (New York: ABC-CLIO, 2013); "Moroni (national capital, Comoros),”Encyclopedia Britannica Online, http://www.britannica.com/EBchecked/topic/392714/Moroni; "Map of Moroni, Capital of Comoros," Maps of the World, http://www.mapsofworld.com/comoros/cities/moroni.html.